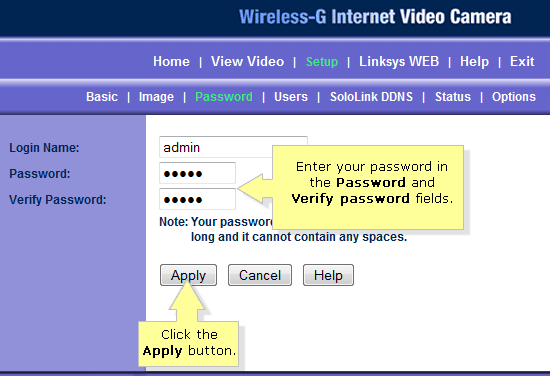 Linksys Wireless Video Cameras have a web-based setup page that allows the user to customize settings and set up advanced properties. Configuring the video camera’s administrative settings, such as the password, is highly recommended to keep people other than you from gaining access to its web-based setup page. NOTE: Before accessing the video camera’s web-based setup page, make sure that the wireless video camera is powered ON and that it is wired to one of the Ethernet ports (1, 2, 3 or 4) on the router. Access the video camera’s web-based setup page. To know how to access the web-based setup page, click here. To access the video camera's web-based setup page using a Mac® computer, click here. NOTE: The model used for this article is WVC54G. Enter the password that you want to use in the Password and Verify Password fields, then click the Apply button. Enter the new password that you have set the next time you log in to your video camera’s web-based setup page.